This was once called the “Mecca” of the film industry. Now it seeks return to glory days. Ouarzazate in southern Morocco was once dubbed the “Mecca” of the film industry for its studio facilities and the stark beauty of its locations, with many Hollywood blockbusters shot there. “Laurence of Arabia” (1962, Peter O’Toole, Omar Sharif), “The Sheltering Sky” (1990, Debra Winger, John Malkovich), “Kundun” (1997, Martin Scorsese), “Gladiator” (1999, Russell Crowe, Oliver Reed) and “Babel” (2006, Brad Pitt and Cate Blanchett) — all of them feature scenes shot at Ouarzazate, which lies at the foot of the scenic High Atlas Mountains. But that was then and this is now. Its film industry is in the doldrums, needing fresh winds to get it moving again. The famous town lost its appeal to international film-makers as economic crisis and the turmoil of the Arab Spring swept across the region. As the North African winter ends, and some snow still graces the mountain peaks, a small group of people attends a casting call at Studio Atlas, one of the town’s largest. Ouarzazate’s lengthy affair with showbiz has life in it yet. “I began going to the cinema in 1967,” says Larbi Agrou, who was in “Asterix & Obelix: Mission Cleopatra” in 2000. “For the past three or four years there’s no longer been a rush by producers to get their films shot. “Most people who work in films here also have other trades to keep them going — farmers, blacksmiths, carpenters. But without tourism and the cinema, Ouarzazate would be dead,” he says. Agrou says the first encouraging signs of a revival appeared last year, and that 2014 “is starting rather well”. 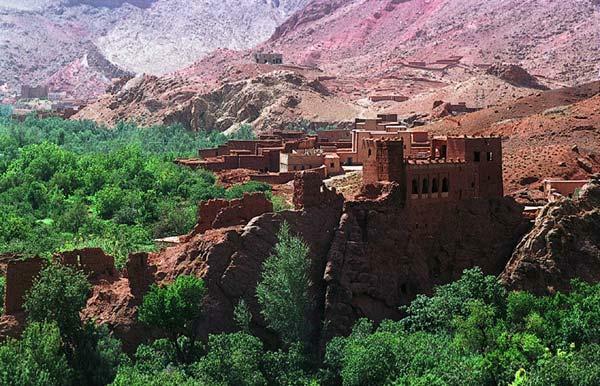 Ouarzazate is known for attracting big-budget historic epics with large casts, and already Nicole Kidman and Tom Hanks have visited since the beginning of the year. “Let’s hope it lasts,” says Aziz, another hopeful at the casting call, rubbing his hands. “There are already four films in production here.” And that means work for hundreds of people in Ouarzazate. In 2005 alone, mega-productions such as “Indigenes” (Days of Glory) by Rachid Bouchareb, and Robert Dornhelm’s “The Ten Commandments” were filmed there. Fast forward to 2010, the year the Arab Spring broke out with an uprising to oust a dictator in Tunisia, and nothing on a similar scale was shot at Ouarzazate between then and last year. A major factor behind that, according to Moroccan film critic Adil Semmar, was the rising insurance costs caused by security problems in the region, notably after the Arab Spring uprisings. “It has made the cost of filming in Morocco more expensive for big companies, so some films were shot in places like Israel and Spain instead,” Semmar said. In an almost lunar landscape dotted with small oases, the imposing Tifoutout Studio, built by Italians in 1994, “is now a ruin,” says resident Said Soussou. Robert M Young’s 1995 film “Solomon and Sheba” starring Halle Berry and Jimmy Smits was shot there, but the Italians then “sold it to our tribe when they left in 1997. Because of the crisis of recent years, some parts are dilapidated,” says another commentator, Mohamed Hbibi. “There are more crows here now than film-makers.” With a decrepit wall as a backdrop, Soussou looks up at the ceiling of a half-destroyed dome that was used for David Betty’s TV movie “The Bible Project” in 2009. “Even when a film-making company does arrive, it fixes the bit it’s interested in, gives the tribe five or six hundred euros and then leaves again,” he says. Most of the movie income has gone on “building a mosque and irrigation ditches.” Ouarzazate’s fortunes contrast with the boom Morocco’s own, heavily state-funded movie industry is enjoying, with 22 feature films made in the past year, compared with around five a decade ago. Celebrated recent productions include “God’s Horses” by the French director of Moroccan origin Nabil Ayouch, which won a prize at Cannes in 2012. Another was “They are the Dogs” by director Hicham Lasri, which won a special jury prize for Arab features at the Dubai International Film Festival in December. Like most Moroccan films, however, these are low-budget movies about the gritty realities of life in the North African country, with little need for expensive desert studios, says Semmar, the film critic. But he also remains optimistic about the future. “The diversity of locations means it’s easy to sell to major producers,” he says. → Black and white Amman, Jordan. ← Nizar Qabbani, Syrian Poet of Love.